It really is so extraordinarily unlikely, isn’t it, that we are all here together spinning on this little ball which burns molten at the core and orbits a small star in a universe vast beyond our comprehension? We have just to accept this blessed gift of life, rejoice each day into existence and revel in the love that binds us all together. Plus enjoy some wicked-good pastry with coffee! Jannie Funster´s last blog post..Another chance! Again excellent thought to start the week. I am leaving tonight for a 3 day course in London. And although I will miss my family and it takes a lot of logistical organization, I am savoring the travel, the time alone, the discovery of new things, places and people. I am always surprised at what the world and life have to offer me. Sometimes I do get stressed out by the many things that are going on and are thrown at me. But I try to stop, breathe and look at the opportunity instead of the problem. It’s not always easy but always very rewarding. Taking the time to appreciate everything that happens in life is an under appreciated skill. How can anyone be too busy to enjoy each moment? Great thought today Lance. So true…. She is my favorite author. Miz´s last blog post..A glimpse into the life of MizFit. I’d never seen this until now, but it is very fitting. So many times in the last little while my wife and I have said to each other, that even though we’re not quite yet where we’d like to see ourselves (geographically or otherwise), we have been extremely fortunate to share the experiences we have. We have been very lucky indeed. We drove down a road that looked a lot like that, actually, a couple of years ago. And we will be back there again. Brett Legree´s last blog post..a tale of two bridges. It is hard to write a follow-up or a comment to something that already says it all, and says it so eloquently. I am drawn to these words “as ordinary as it all appears.” I am learning that my “ordinary” days are anything but – they are magical, bewildering, divine. Jannie (above) said it very well. Thank you for this, Lance. It is earlier than normal for me to be up and so I thought I would start the day with your quote of the day and what a wonderful one it is! I love the photo and the words really do make me sit back in awe at where I am and how I got here. Every moment and thought and person and place is a significant part of each of our lives. May we be grateful for them all, for they all served a bigger purpose than we will perhaps ever know in our growth and on our journey of life! To echo Jenny’s words above– “Beautiful image and words” – I agree in so many ways. It is sometimes too easy to just go with the flow and let ourselves be handled by life events and some have nothing to do with us yet we flow without ever savoring the moments. In a most fun trip with my girlfriends last weekend we decided it was time to savor the moments we are given, to look back at all the joy, all the blessings, and be happy for every event. From this moment on we will be more mindful of what we have so that we can create memories of happiness in our lives. Thanks for the inspirational message Lance–as always, very appropriate! I just love your blog! I have been thinking about this a lot lately. How wonderful my life truly is including the challenges. All of it makes me who I am today, and where I am today. And knowing I can have a hand in creating that is really beyond my imagination. I never heard that quote before, but I think it begins to illustrate why I enjoy simple living. When it is realized that each moment is already extraordinary, then seeking and wanting fall away and gratitude remains. I think this is my favorite Sunday quote to date. When we really take a deep look at our lives we see the magic in everything that we do, see, and eat. We have an opportunity to open our minds and bodies to all the beauty in every moment. The funny part is I don’t even think my imagination can truly wrap my mind around that brilliance of it all. That’s why I love this quote so much. Absolutely adore that quote. I feel that very same way sometimes — so overwhelmed by all that has happened to me (even the mundane things) and all that is to come. For me, it’s an awe-filled feeling of disbelief that never ceases to amaze me. Positively Present´s last blog post..do you have a clear view? Every experience lends something to my life. great, just great. What a fantastic quote. I was just telling my brother this morning that my life, while ordinary, is anything but. It feels magical most times. Perhaps in the simplicity of it all? Beautiful photo. My friend has a photo like that from some land here in Costa Rica. I will have to find it and put it out there. I’ve experience some of the most chaotic events in life, but even during those events I learned to see the beauty of it all. How I love growing dear Lance!!! Tabitha@ichoosebliss´s last blog post..Can I Quote You? I find absorbing the wonders of the world an overwhelming event for my life. I am constantly amazed at the creativity of God. From the smallest single celled organism to the blue whale, from a moss to a giant red wood tree, His paint brush is miraculous and cries for my worship! Beautiful thought for the day! Ordinariness (or simplicity) has its own world of beauty within, making the ordinary Extraordinary! No flourishes or drama required – what some would say is blah, I say ahhhh! suzen´s last blog post..Happy Anniversary Honey! Wow, it’s always beyond my imagination to go back and reflect at the many ways I’ve been, how I’ve tried to compensate and who I really was. I know it’s all up there somewhere still. What a wonderful life we lead. I find the purely authentic times to be the most memorable. Hi Lance: I think it was Einstein who said that there are two ways to live life: one is as if nothing is a miracle and the other is as if everything is a miracle. Your quote reflects the second attitude, which is definitely the way to go. Isn’t life amazing? I often think about my past and all the things I have experienced. Not all of it has been pleasant but it has served a purpose. I have known and still know many beautiful souls. Life is full of wonder and that wonder is around us all the time. The ocean is about an hour away from where we live and whenever we go there, I am always made aware that my so called problems are really small in comparison to the awesomeness of the ocean. The photo reminds me of when I was 15 years old and witnessed my sister’s boyfriend drown at our family picnic. My mom had 10 children and Larry was an only child. It all seemed so unfair, cruel and insane at the time. near their home. It looked just like this except no benches. We were healed by the illuminating light that shined on us and by the strength of the tall, old and strong trees as we talked and walked our way through the wonderful joyful memories we shared. Louise clung to our every word. We had stories and knowledge of Larry she missed out on for the simple fact that boys don’t share with their mothers like girls do. And share we did. The quote: It is beyond my imagination how I came to be on the path I’ve chosen and the pain and sorry and joys and laughter I have lived through and learned from. I marvel at how I’ve survived it all, the fear and pain and the love and joy that passes through my life. I look forward to each and every day and the gifts that are mine for the taking. My life looks small compared to his and I’m blessed to be able to learn from “the shoulders of giants” who have gone before me. It just goes to say that it’s the little things in life that can be the most extraordinary. Sometimes we take for granted the meals, the people, the travels… But when if we just stop for a moment to appreciate all we have…we realize how blessed we are. Thank you for this today, Lance! It’s amazing to think we focus on the bad things in the world and complain that life can be a bad place to be, however it’s the little things in life that renews our faith in the world. Lance- love the quote and it is so beautiful and true. We need to always appreciate each and everything that comes in to our lives. This is awesome the photo is gorgeous and the quote rocks. I’m all about taking my time to see the little things lately, in life it seems we miss to much just letting it go by! How beautiful, Lance. Indeed, every breath is a moment of prayer. A prayer of thankful awe. Each one of us on this lovely planet is SO markedly blessed, even those who may believe otherwise. To be aware of that all the time is in itself a wondrous miracle! May we all be so… Happy week, dear Lance! A beautiful post 🙂 It made me think about my journey of life, where I have been, who I have met? And where my journey will take me next..
Giovanna Garcia´s last blog post..How the first rainbow was created? You match the words and photo perfectly! Wonderful! Lisa’s Chaos´s last blog post..Wonder what channels he gets. . . I love the image! It reminds me of the journey that I am on. Each tree may look ordinary but is totally unique. It helps to give me shelter should I need to take a break and rest. There is also light at the end of every dark tunnel. Hence everything is in PERFECT ORDER! Now, that’s an amazing thought! Thanks for this reminder of the magic in the ordinary. Sometimes I walk along not noticing anything much, then suddenly I’m drawn to a blade of grass and stare at it for minutes, realising that this tiny thing is itself a miracles, and there are millions more like it surrounding me. That thought always blows my mind. @Jannie – Hey, look who’s here…it’s Jannie! I think it’s pretty extraordinary, how this place we call earth somehow manages to function so well! Earth is an amazing place isn’t it! Now, about that wicked-good pastry, and some coffee to boot – how’s that for life getting even a bit more extraordinary! @Mimi – Hi Mimi. Have a great trip to London! And yes, here you’ll be traveling, eating at new places, and staying in places you haven’t before – just another trip to someplace. And yet, it’s pretty awesome just when you really think about the many new experiences you’ll have – and that’s just in three days in London! Very cool! @Jarrod – Hi Jarrod. Each moment of our life is one we’ll never have again. And it’s uniquely ours. Yet, how often do we let these moments go by, without even thinking about them? Great point, and one worth delving deeper into for each of us – as to how we really take in ALL the moments of our life. @Natalia – Thanks much Natalia! @Miz – You know, this quote is my first real experience with Jhumpa Lahiri. And I love this one, and what it’s saying – about just really how amazing our seemingly ordinary lives are. Will have to read more of her stuff! @Brett – Our lives here are amazing! We have so many opportunities, so many places to travel, so many people to interact with. And even if that’s just within the confines of the area we live in – really, it’s still pretty amazing how much there is to see and experience! @Jenny Mannion – Hi Jenny. What an excellent point – sometimes it takes a solid looking back at all we’ve done to really appreciate how truly amazing our life has been. In our day to day activities, everything can sometimes begin to seem so ordinary and routine. And if we can reach a state where we can experience that same appreciation for our life now – instead of looking through a rear-view mirror on our life – what a great place to be and truly experience! Jenny, thank so much for this thought, and really giving me another perspective on this quote! @SpinDiva – I found the image to fit so well to this quote. It really felt like a journey through life, looking at the photo. And this journey, the trip through our life – our one shot we get at it – really is filled with so many moments. And really taking in these moments, how powerful that can be. Thank you for sharing about your recent weekend trip – and how really you lived this quote! How awesome! @Stacey Shipman – Hi Stacey. Another great point – this idea that life isn’t all rosy all the time. And still, it all makes us the person we are today. As morbid as this probably sounds, I think about this when I hear of a bad car accident – and how a seemingly simple thing – that can change your schedule by even just a few seconds – can be the difference between life and death. And this thought alone – in a more positive spin – makes me truly realize that I DO have a hand in creating much in this world – some things of which I’ll never know. I’m probably getting off on a tangent now, but this also leads me to thinking about just how my actions can affect so many downstream events – including things I’m completely unaware of. Maybe it’s not really a tangent – because this takes me right back to this quote and just how “ordinary” can really be way beyond my imagination. @Diane C. – This quote was new to me also, Diane. Simplifying our lives is just such a great way to connect with what truly matters, and truly appreciate that also. And that all really does lead to seeing the extraordinary in the ordinary. @Karl – I just stumbled upon this quote a few days ago – and knew right away this would be a wonderful thought today. You know – I feel the same way about trying to wrap my mind around life and all it’s intricacies. Life really is extraordinary! And hard to really and fully grasp just how interconnected our lives all are. @Jim Gaudet – Hi Jim. The photo evokes for me such a feeling of a journey through life, which I think fits this quote so well. @Suzen – Hi Suzen. That’s a great way to look at it – as seeing the “ahhhh” in “blah”! Our ordinary lives really are extraordinary! @Tom Volkar – Hi Tom. You bring up another great point, that when we experience truly authentic moments in our life, these are moments that become so deeply memorable. And the more we can have of these – moments of real authenticity – the more our lives become aligned with our true being. And that is definitely an amazing place to reach! @Marelisa – Hi Mare. I love the Einstein quote, thanks so much for sharing it! And yes, it really does fit this so well – everything IS a miracle – especially if we believe that to be so! @Tess – Tess, I’m so sorry to hear about this story. And I can’t fully imagine how difficult the days were that followed. That you were able to share a bit of Larry with his family, I’m sure that was a gift for them, very much, to hold on to. Large trees can be very therepeuatic, as they stand tall and have weathered many storms. And they provide a level of comfort, like their branches are extended over us – to protect and hold us in. I’m glad they brought you relief during these days. And thanks for sharing the quote – it really fits so well here to this idea that each moment is something special. And yes – sometimes our life may look small compared to others. But is it, really? We’ve each had experiences that have led us to where we are. Some may be more well-known, but our lives, our moments are all pretty special too. Tess, thank you for expressing so openly here, for sharing some of the grief you’ve experienced, and how your life has been shaped. You’ve spoken with such heart, and having you here today means alot to me…thank you. @Caroline – Hi Caroline. The little things…yes, that’s it! And these are the things we more likely take for granted – yet, they are what make the ordinary extraordinary. We are truly blessed! @Steven – Hi Steven. It’s easy to get caught up on the negativity bandwagon. And yet you bring up such a great point – we are renewed by the little things – a thank you, helping someone pick up something they’ve dropped, a helping hand around the house, etc, etc that makes all the difference. Little things…big effects. @Bunny Got Blog – Hi Bunny. Appreciating everything that comes into our lives – not always easy, that’s for sure! But when we do…I think that IS when we start to really see how extraordinary ordinary is. @Giovanna – Hi Giovanna. The life journey each of us has been on – the people we’ve met and the places we’ve been – is so amazing! And where we’ll be going – what lies ahead for us – unknown, and yet most definitely filled with extraordinary! @Lisa’s Chaos – Hi Lisa. Thank you! @Mama Zen – Thanks much Kelli! @Sami – I LOVE the Henry Miller quote! It fits perfectly with this quote today, and just how truly miraculous life is! Slowing down enough to truly appreciate all of this – that’s a great place to get to. And when we do, when we really feel how connected everything is, and how many miracles are right around us all the time – life does become pretty extraordinary! Thanks for this. What this brings up for me is how many of the meals I’ve eaten, walks I’ve taken and so on have had a rushed quality about them — and there always seemed to be a good reason for it at the time, but recently I’ve come to see that my best memories are created when I take my time. What an awesome photo. It’s gorgeous. I also love the quote. When we really stop and contemplate all we’ve experienced and the people we’ve met, it is indeed extraordinary. It’s just a matter of slowing down enough to appreciate all we’re blessed with. I have read a couple of Jhumpa Lahiri’s books. She writes beautifully. Great quote pick, Lance! Every sensory memory becomes part of an incredible tapestry. What a blessing to have the life we have today! And let’s be nice to this one – it’s the only one with beer. Jannie Funster´s last blog post..Got Gravatar? No? It’s Easy! @Vered – Life is amazing isn’t it! Especially when we really realize this at a deeper level. @Chris Edgar – Hi Chris. So well said – it can be so easy to rush through life – but where is it getting us, and what are we missing along the way? When we really think about this – taking the time to slow down and truly appreciate all that is in front of us, at this moment, is a beautiful thing. @Barbara – Hi Barbara. I love this photo too – it seems so life-giving. And with a tree-lined path, benches along the way – it really seems to fit this quote so well! And that’s the key, isn’t it – taking the time to stop and really grasp that which is in front of us – extraordinary for sure! @Jannie – Earth is a pretty great place, isn’t it! So…this is the only planet with beer, you say? So now I know…you’ve traveled to many a far away galaxy! I knew it – you are OUT OF THIS WORLD! Hi Lance .. a wonderful thought – that we’ve all experienced so much .. and so much to draw on. Tess has a really sad story .. that must have been the most monumentous period of her life .. but it sounds as though the family were so helpful to the grieving parents. We all have sad things in our lives .. I have .. but they don’t sit in my consciousness normally – we are so lucky to have our soul to guide us through and to ensure we remember the good things. So many have suffered so much .. wars, terror, cruelty and then to lose it all via a fraudulent scammer .. that is too terrible to consider – what wonderful words “I’ve risen from the ashes before and I’ll do it again” … we all need to remember Ellie Weisel in these times ..
Hilary´s last blog post..Pastry Rocks … ?! Life and everything can be so surreal sometimes. Realizing that THIS IS IT is exhilarating. I have been fortunate to be able to take joy and amazement in the little things. I am always grateful for this gift! Great photo and very powerful quote. As I travel local as part of what I do, your quote speaks volumes. I’m constantly bewildered by what I see, where I see it, what I eat when I’m there, and just the plain old joy I feel each time I discover or rediscover something. Even though I don’t go very far most of the time, I am still intrigued by what I find and what I see and encounter, ever a few miles away from home. Sometimes, it doesn’t even feel like “home”. I am often bewildered at how fast time passes and how much of life has passed. This year marks 30 years since high school grad, my youngest is 21, and 28 years of marriage. I do have moments when I look back at how fast it went but I am also thankful for all of those days. I am still amazed at the changes in our world even since my youth. I can only be joyful for the coming years and experiences. Thanks for the photo! It’s amazing when you really stop and think about all the many things you’ve done in your life, isn’t it? And yet it still passes so quickly! Love that picture. If you think nothing glimmers, just look at your soul! And when you look in the mirror, know that you are looking at the greatest miracle of all! @Hilary – Hi Hilary. We all have had a lifetime of experiences, each unique and each having some impact on us. Thank you for reading here today, especially through the comments. Tess shared a very personal story, and one that adds so much meaning to this quote, and to life. Tess, if you’re back here – thank you for that. And yes, sadness is something all experience to some degree, and that’s part of who we are too. The quote by Ellie Weisel, these are words that speak deeply of coming back from difficult experiences. As difficult as life can sometimes seem, there is always light out there for us… Thank you, Hilary, for this wonderful comment. @LisaNewton – Hi Lisa. Right here, close to home – the things we see everyday, or the things we have missed and are now seeing, or the new within our neighborhoods – it’s all very much part of our experience with life. And there really is so much to discover right where we’re at – and that’s pretty wonderful! @avtcoach – Hi Coach. Wow, that’s a great point. When we look back on our life, even when we recall times where life seemed to slow to a crawl – looking back, it all seems to have gone so fast. It seems like just yesterday that I was getting married, and having babies crawling around the house. Now, I’ve been married 15 years, and my youngest child is nearly done with elementary school. It does seem so hard to believe. And then it also makes me realize that life continues on – it doesn’t stop, slow down, or speed up – and I’m here with this one opportunity to live my life – how will I choose to do that? A great question to think about. Thanks much! @FatFighterTV – We do have a lot of experiences we’ve lived. And yes, in looking back, it all has gone so quickly. Which makes me really want to savor the moments I have, as well as truly live as my heart speaks to me! Great thoughts on this Sahar, thank you! @Henie – Hi Henie. 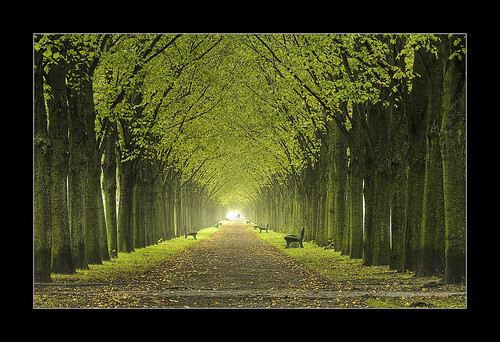 Yes, isn’t the photo amazing – and I just love how it goes with this quote, a path, with the benches, light near the end of the tree-line boulevard. It all seems so fitting. Oh, that really is a wonderful thought too – we are all miracles – each of us! And that’s pretty awesome!